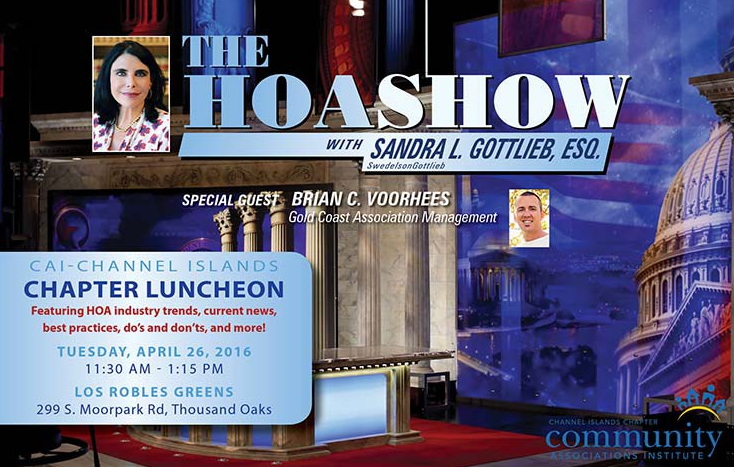 Catch the Second Episode of The HOA Show with Sandra Gottlieb! • Current events, trends and ideas occurring in the HOA industry and your communities • Is HOA living all negative? Navigating your way through Homeowner complaints, issues and demands. • New industry developments & technology news: drones, electronic voting and dealing with issues of potential defamation on social media • Privacy Issues: Can members record a board meeting and use it as evidence against the board? Can boards enforce a “no recording” policy? Follow this link to register for the event! Thanks, we’ll see you there.